Stacy Lyn is based in the USA. My photo gear is always ready for the REAL wild African continent. My pursuit of new experiences pushes me to continually evolve my vision. I enjoy sharing my comprehensive image collection distinctly African cultures and its people, wildlife, landscapes and macro each evocatively poignant. The image portfolio and custom photographic books reveal an intimate perspective of the wider natural world of Africa and unique places of interest close to my heart. Accompanying the photographs are extraordinary stories with real encounters during photographic adventures. The wildlife and cultural images I photograph are captured during intensive African expeditions. 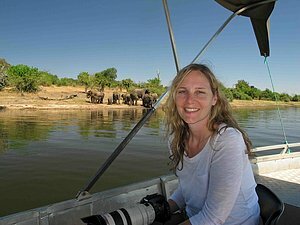 I am exposed to the African bush in wide-open spaces, close-up wildlife encounters even when predators are at work. My sleeping accommodations consist of a 4x4 roof top tent and camping for the duration of my travel. This is what I live for all while being lead professionally by a National wildlife and photo guide with many years of experience in the photographic industry. October 2017 marked my 12th exciting African bush adventure encompassing a three-year sabbatical in Cape Town, South Africa. I enjoyed an intensive leopard research and black maned lions of the Kalahari. Previous African photographic expeditions included deep into the wild, thick sand and certainly no game fences of Namibia exploring the elusive desert elephants while also studying hundreds of African elephants and the endangered African wild dogs, two but very different social species in Botswana. All this is built on extensive and hands on experience in South Africa with 12 captive orphaned elephants and a constant aim of placing elephants living in poor welfare conditions in improved environments in early 2012. I was on staff for 14days, 24/7 collecting social and behavioral data. This also led to a multiple day segment spent deep in the legendary Knysna forests, where the last of the most southern elephants are located on the African continent. My aim with each photographic expedition into Africa includes a series of meetings with scientists to discuss past and present elephant research and working closely with respected wildlife rangers at Africa’s premier game reserves. The predominate focus is always designed to incorporate several aspects of wildlife conservation all while providing comprehensive behind the scene look at many facets of elephant behavior, anti-poaching exercises, ecology, and telemetry tracking of cheetah and rhino, each playing important roles in behavior patterns and to the ever-changing African bush environment. Through all of these activities I tread lightly, showing respect and appreciation to the people and wildlife of Africa I interface with.